Jenna Dewan returns to mentor the Junior Teams division, as they join the Upper division in “The Cut,” sending half of them home. Six acts from each division are still in the competition on "World of Dance," but by the end of "The Cut," half of them will be gone. No more head-to-head competition where you can try to eyeball your competition and choose the weakest competitor. Now it’s you versus everyone in your division. It’s time to step up or step out. As an added twist for the acts, the judges step in to mentor each of the groups, with former host Jenna Dewan returning to help the Juniors because new host Scott Evans doesn’t know anything about dance. Once again, we got some amazing and stellar performances, but perhaps the most surprising was one that incorporated a red, heart-shaped balloon. Who knew such an on-point and silly prop could break all of our hearts. Dancers are divided into four categories: Junior (17 & Under, 1-4 Dancers) and Upper (18 & Older, 1-4 Dancers). First up it’s the Qualifiers, a free-for-all round, with no head-to-head competitions. This season, acts need to score 85 points out of a possible 100 to advance to the next round (it was 80 in previous seasons). Each act is judged 0-20 points in each of five categories for a possible total of 100 points. A quick reminder about me: I spent nearly a decade of my life sweating and bleeding to the music as a dancer, all for this moment: armchair judging a dance competition. From a young boy learning a shuffle-ball-change to performing with the St. Louis Ballet Company, I experienced the ups and downs of one of the most difficult, physically demanding sports on the planet. Fair warning, since I’m safe at home, I’m probably going to be a little harsher than my colleagues Ne-Yo, Jennifer Lopez, and Derek Hough. But I might be nicer, too. Maybe. (Upper) Once again, their tricks are incredible. There was one lift that came down a little off-center but there were so many others we’ve never seen before it’s barely worth noting. Jonathan needs to work on loosening his hips so he can sink deeper into the Latin flair of the whole performance. If he’s not just going to be a lifter, he needs to continue to work on the quality of his movement He’s hitting harder, now he just needs to hit better. (Upper) What a gut punch of beauty. There were so many raw, visceral moments throughout, you couldn’t help but feel torn up by the end of it. Some of the lifts and stunts were just jaw-dropping, too, with their complexity. It was both hard-hitting and so elegantly beautiful. Smart choreography, great storytelling and transfixing presentation. (Upper) What a cool and unpredictable routine. This is one of the most exciting acts in the competition because they bring a little of everything to their hard-hitting style. This time it was cape-work a la paso doble with some classic partnering, hip-hop, krump and whatever else they felt like. On top of that, they are so visually interesting, sharp and perfectly in synch with everything. It was all very controlled power, which was interesting and unexpected throughout. (Upper) Briar took Derek’s note to present herself to the judges and she did just that throughout this gorgeously difficult routine. The athleticism on display was something many gymnasts couldn’t muster in a floor routine on mats. Briar was in a class of her own in that regard, and then she added an emotional connection on the perfect song and really soared. Let’s just say J.Lo wasn’t the only one having a visceral, emotional reaction by the end. (Upper) The brothers came in with a story about their brotherly connection, the ups and downs and their love for doing what they do together. It’s rare for tap to create story with heart like this, so it was something special to see. And they danced it just beautifully. The tapping was so intricate and artful, it was really cool to see them play off of one another and even battle a little bit before coming together with love and respect. (Upper) So here’s a gamble. You’re a popper which is about cool visual tricks. But you’re in a competition, so you decide to add emotion and heart. And you do so with a literal heart balloon. Bananas, right? Well by damn John made that ridiculousness work. His balloon work was nothing short of genius, and then how he fell apart without it. He just elevated his own artform into something we’d never seen before. Damn, boy! (Junior Team) The emotional impact of the dramatic catch wasn’t strong enough even after Jenna’s guidance, but these guys are so tight and in sync it doesn’t matter. They dance like they have a hive mind and it is mesmerizing to watch. The smallest movements become magical and yet they perfectly time their larger movements, too. They’re still one of the strongest acts in the whole competition. (Junior Team) This wasn’t their sharpest or most innovative choreography. The basketball felt underutilized after Jenna trimmed its use so much and the whole routine fell kind of flat. There were some nice moments, but there was also some sync issues throughout the routine that took you out of watching the moves and instead left you noticing who was behind. This crew is much better than this routine. (Junior Team) Mostly clean, the girls did a great job of selling their girl power message in this routine. It had lots of little moments spotlighted throughout surrounded by wonderful choreography. And in most moments they were aligned together and working as one to tell that story. It could be a little cleaner and a little more clear with their intent in each move, but overall this is a solid routine. They just need to work on consistency throughout. (Junior Team) They are so young and yet so poised and elegant and talented. And what a mature piece of choreography to tell the story of the growth of Naia, the little girl in the group with selective mutism, growing through the competition. It was just beautifully presented with strength and conviction. Some of the moves we’ve seen before and that can be problematic in a competition, but it was beautiful to see that sisterly support. (Junior Team) They’ve never scored particularly high and came in needing higher than they’ve ever scored to move on, so the pressure was on with this wacking crew. But they didn’t even get a full performance segment on the show, instead we got moments interspersed with judges’ commentary, which means it wasn’t sharp enough to even warrant their own moment. Our scores are based on what we did see. The reality is at this point they’d need to fusion this with some other styles to come close to competing with some of the other acts as the wacking choreography was just too rudimentary. (Junior Team) Voguing was new to this ballroom group, so why not add it to their Cut routine? What’s life without challenge? It was certainly a bold move, White gloves and hands flying everywhere, this should have looked way too busy and yet it was perfectly controlled. In fact, it made you totally unable to look away. The whole routine was so fast, but so precise there was almost perfect synchronicity throughout. This was an incredibly strong statement. For the Upper division, Poppin’ John added heart to his routine and scored a spot in the next round, sharing the stage with two other emotional acts in Briar Nolet and Derion & Madison. 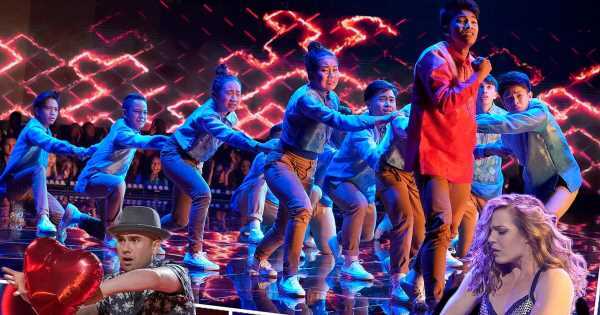 It just proves how important it is to connect to the feelings of the judges and the audience to really take your art to the next level. Then in the Junior Teams, Dancetown Divas really made a strong — if imperfect — statement to jump in with early front-runner The Crazy 8’s. But it was VPeeps who made the most noise on the night with the strongest score of the night, and second strongest of the whole season. It’s also worth noting that both Redemption acts from these divisions powered their way through the Cut, proving the value of that addition this season and how much of a fire it lights under those in its path. Next week, the Juniors and Upper Teams divisions battle it out for the final six spots. "World of Dance" airs Sundays at 8 p.m. ET on NBC. Do Any of Hollywood's Superhero Actors Perform Their Own Stunts? Woman offered £7,700 to break up with fiancé by his parents – but did she do it?